Looking to fire up the grill this summer but stay Whole30 approved? 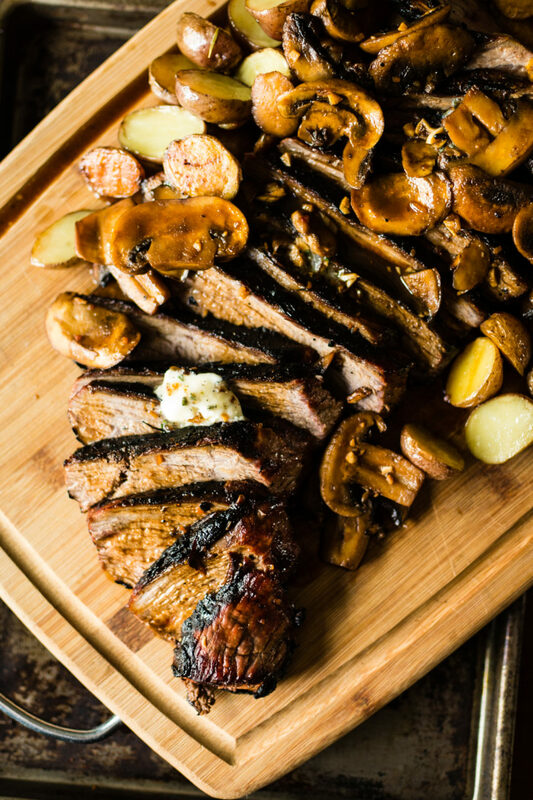 This Grilled Tri-Tip Steak with Mushrooms and herb compound butter will knock your socks off and is completely Whole30 compliant! 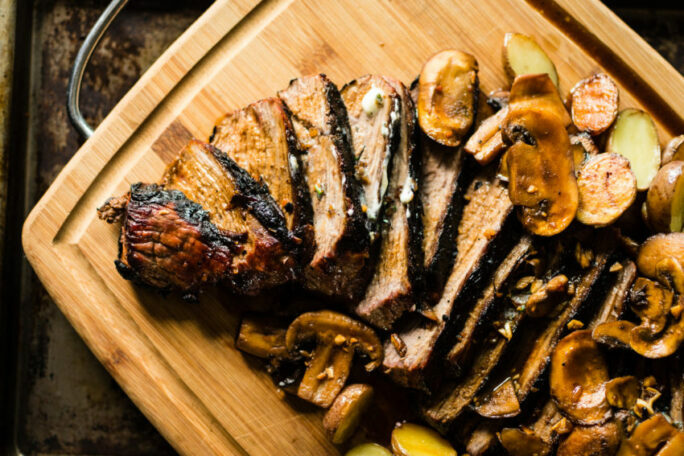 The grilled tri-tip will prove to your friends and family that eating lean and healthy doesn’t mean you have to sacrifice flavor. There’s something about a grilled steak that nails it every single time in a way that poultry and pork just can’t reproduce. A great grilled chicken or pork chop will satisfy me every tie and can really be done spectacularly, but beef, beef is where my mouth starts to salivate and I really get excited about the possibilities. Beef, in my opinion, is the simplest of proteins, needing little to jazz up the inherent flavors. As long as the cut is cared for properly, it holds a perfectly fine flavor all it’s own with little more than a sprinkle of salt. Needless to say, when heading to the butcher for a weeknight grill out, I snagged a fresh 2-pound tri-tip off the counter as I saw them arranging their cuts without asking what else was around back. It’s not a cut I get to experiment with in my region due to its lack of popularity and rarely do I find it not in a vacuum sealed bag with a Santa Maria seasoning already working it’s way in, inspired by its humble rise to fame California. We can play with rib-eyes and strips for days, but grilling a fresh tri-tip? Oh, lucky day. For $26.57 I grabbed my chunk of meat and set out to make supper. The tri-tip is a triangular cut from the bottom sirloin of the cow. It isn’t always the most tender of cuts, but is long and lean and with a little love can produce a fantastic meal. Tri-tip isn’t as hot and fast as a thin steak, so give it a little time over the heat to allow the muscle to really break down without seizing up and add time in for a good rest before slicing thin and diagonally on a bias against the grain. 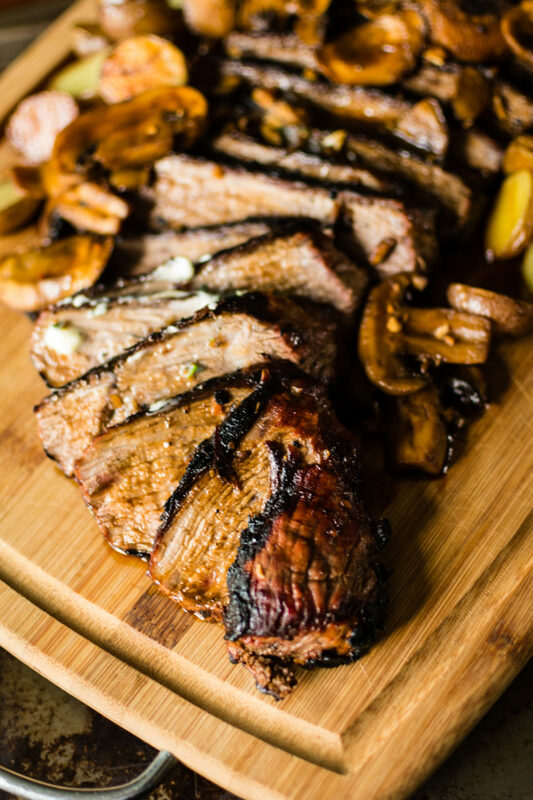 Now on to the grilled tri-tip with mushrooms…. Not interested in Whole30? This steak is great with regular soy sauce and Worcestershire in place of the coconut aminos. Whisk the coconut aminos, pineapple juice, 3 cloves of garlic in a small bowl. Pour over the tri-tip steak in a resealable bag and allow to marinate for 6 to 8 hours, flipping once or twice as it sits. Meanwhile, With a fork, mash the remaining 2 minced cloves of garlic with 4 tablespoons of the butter, parsley, thyme and a pinch of salt and pepper. Roll into a log in plastic wrap, seal, and place in fridge until ready to use. When ready to cook, prep a charcoal grill for cooking over indirect heat. Preheat the oven to 425 degrees F. In a large bowl, toss the potatoes with olive oil and a little salt. Spread evenly onto a clean baking sheet and cook until golden brown, flipping once, about 25 minutes. Prep the mushrooms by melting butter in a large skillet over the grill and sauteing until liquid has dissolved and been absorbed. When ready, cook the tri-tip for 10-12 minutes, depending on thickness, flipping once. For rare, aim for a temp of 130 degrees before pulling to rest. Wrap in foil with a large dollop of compound butter and allow a rest of 10 minutes before slicing thinly against the grain on a bias. Serve slices with fresh compound butter melting over top if desired. To keep this recipe Whole30 Compliant - Skip the compound butter! Infuse ghee in a small saucepan with 2 minced cloves of garlic, parsley, thyme and a pinch of salt and pepper. When ready to serve, drizzle over the sliced tri-tip and veggies! Looks delish .. just so you know, the butter is not Whole30 approved … perhaps substitute with ghee? This sounds absolutely fantastic! Thank you for sharing at the Delicious Dishes Recipe Party!